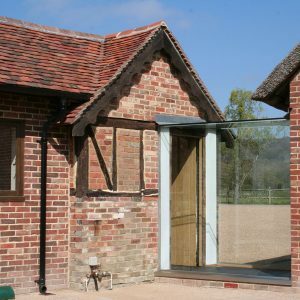 A period home in West Sussex required a structural glass link between the original house and a contemporary garden room. 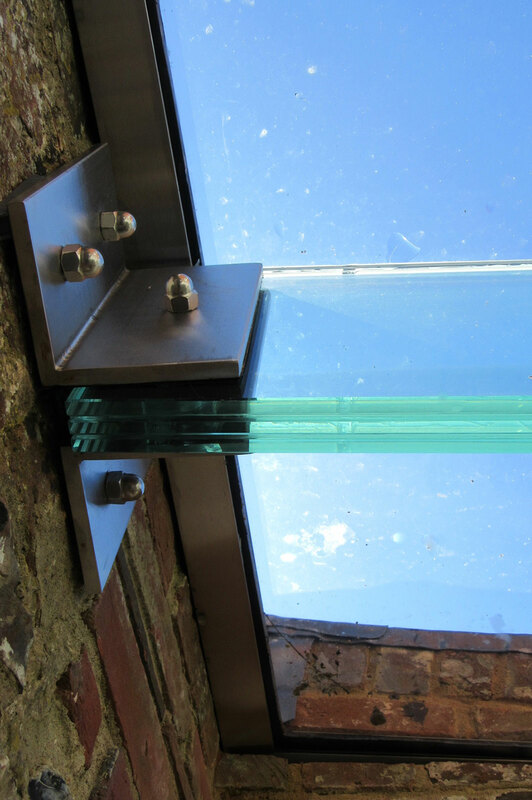 A single glazed structural glass linkway created with minimal metalwork, utilising structural glass beams and glass fins. The new owners of Church House wanted a fully secure and weatherproof link to their garden room so they could use it as light, airy and welcoming play space for their young children. 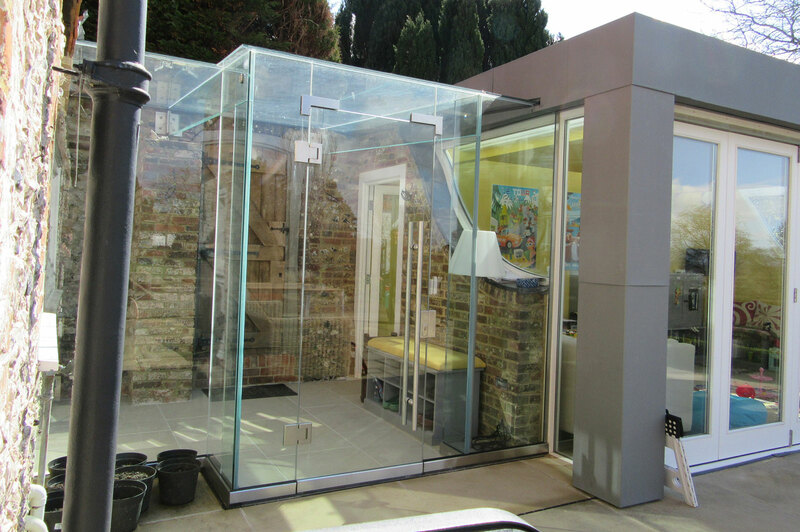 A structural glass link offered the optimum solution, with minimal physical impact to the house and the new play room, whilst at the same time ensuring maximum light levels were retained to all areas. Using stainless steel channels and fixings meant it was possible to install the new glass structure without a requirement for footings, whilst the choice of structural glass fins and glass beams in the construction provides an exceptionally stylish and contemporary result. 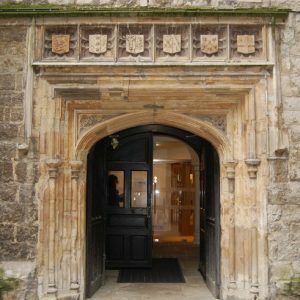 One side of the structure is formed by the original side wall of the house, which also includes a side entrance to the property, giving the glass link the additional benefit of creating an attractive glass entrance porch for the back door. Glazed walls were formed from a series of 12mm thick glass panels, set into surface mounted stainless steel floor channels and recessed wall channels. 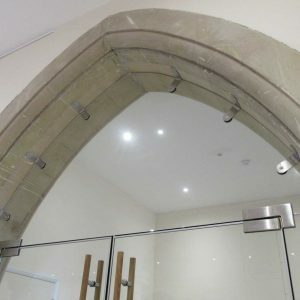 Lateral stability was achieved for the walls with the use of structural glass fins, which also provided connection points for the glass beams which support the roof. The fins are formed from 33mm thick laminated toughened clear float safety glass, fixed to the floor with brushed stainless steel brackets. 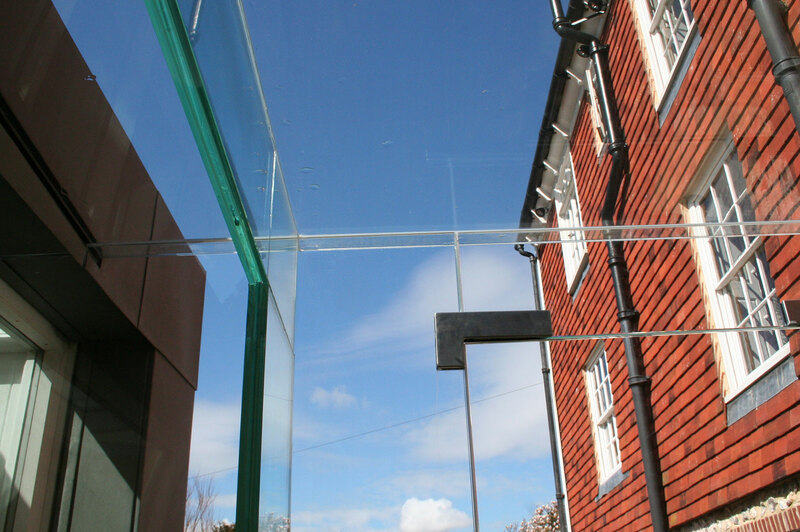 The three structural glass roof panels are made from laminated toughened clear float safety glass, 13.5mm thick. The panels are bonded to wall mounted stainless steel channels and supported on two 250mm deep x 33mm thick toughened and laminated glass beams. For maximum integrity of the structure, the glass beams were designed to interlock securely with the vertical glass fins. 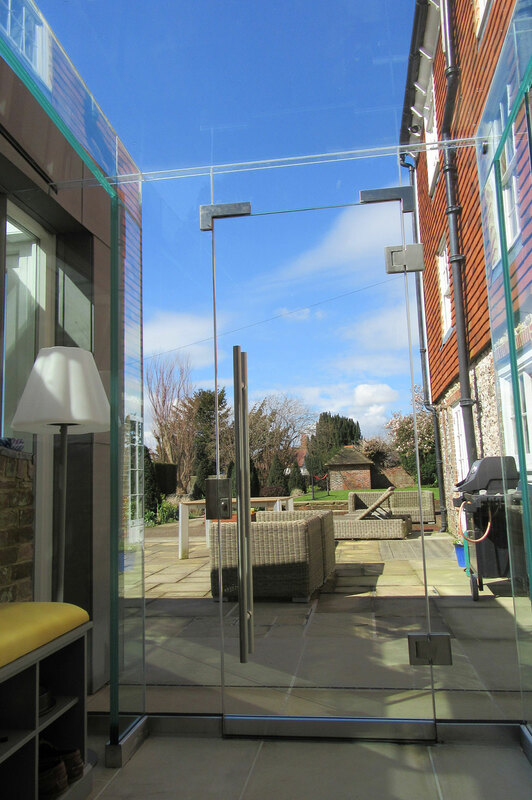 A glass door opening onto the garden area was installed with self-closing hinges and a secure lock, providing an additional level of security for the homeowners. On Ion’s recommendation a 50mm continuous glazing rail was fitted to act as a kick plate around the bottom of the glass, protecting it from accidental damage; the exterior glass door was fitted with a full width bottom rail with concealed brush to prevent any damage. 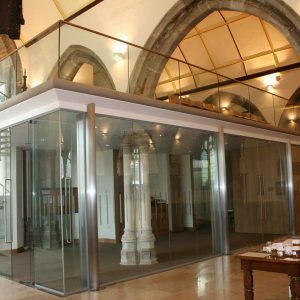 Access to install the glass linkway was difficult and Ion Glass arranged a genie lift to install the heavy glass roof panels. 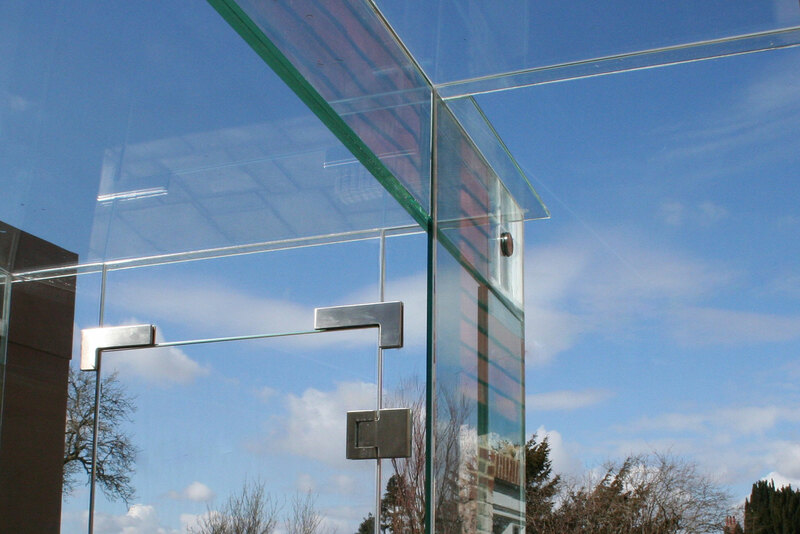 The resulting glass lobby is stylish, contemporary and functional, fully protecting the church from the on-shore wind gusts that used to plague both parishioners and the church services. The new glass lobby has greatly improved the entrance without detracting from the imposing architecture of this landmark building.